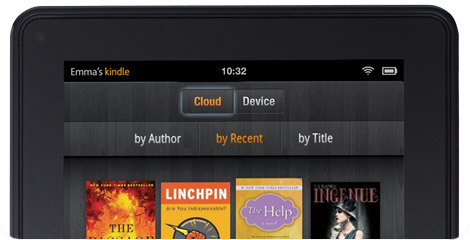 Amazon's Kindle Fire Tablet - iPad Killer? 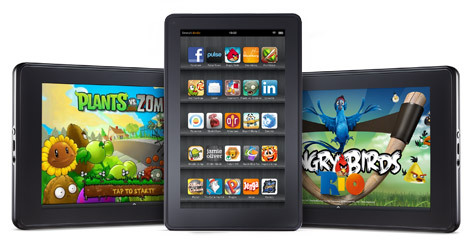 Amazon launches Kindle Fire, an Android based tablet that could threaten the iPad 2's status as king of the tablets. Amazon has announced they will launch a new tablet that could be a direct competitor to the Apple iPad. The Amazon Kindle Fire tablet will only retail for USD$199, available for pre-order now, and available in November, and uses Google's Android operating system to allow users to consume Amazon provided content, via its Kindle eBook store, as well as Amazon music downloads, streaming and VOD content. Users can sign up to the USD$79 Amazon Prime loyalty program, and get unlimited access to a catalogue ofe 11,000 streaming titles (customers also get free two-day shipping as part of the membership). Armed with Google's Android 2.3 operating system, though slightly behind some other Android tablets that are already on the tablet-oriented 3.0 "Honeycomb", a 1 GHz custom dual-core processor, 512 MB of RAM, the Kindle Fire would otherwise be well suited to directly compete with the iPad 2, other than the fact that the Kindle Fire features a 2.7 inch smaller screen (7 inch screen, versus the iPad 2's 9.7 inch screen). The Kindle Fire also can't compete directly with the iPad 2 because it lacks a camera, microphone, and is limited to Wi-Fi connection only, with no 3G/4G model planned. Where Amazon can compete with Apple though is in the content space, as Amazon is probably the closest challenger to Apple's iTunes, in terms of music, movie and TV purchase, rental, download and streaming. But even compared to existing Android tablets, the Kindle Fire appears to be a watered down version, possibly to keep prices low, and perhaps also to limit users to Amazon services. For example, the Kindle Fire will also only come with 8GB internal storage, with no ability to increase storage via microSD cards, as the Kindle Fire does not even feature a microSD port. The Kindle Fire also won't support Google Book's EPUB format, preferring Amazon's own AZW format (other formats supported include: TXT, PDF, unprotected MOBI, PRC, Audible/AA/AAX, DOC, DOCX, JPEG, GIF, PNG, BMP, and non DRM'd AAC, MP3, MIDI, OGG, WAV, MP4, VP8). Critics have question Amazon that, in order to keep prices low, whether they will be making a loss on each tablet, but CEO Jeff Bezos has refuted such claims, saying "We want the hardware device to be profitable and the content to be profitable. We really don't want to subsidise one with the other." Amazon's original Kindle reader will still be available, at USD$79, with two new touch-screen models, one without 3G and another with the feature, launching for USD$99 and USD$149 respectively. Customers can pre-order the Amazon Kindle right now on Amazon.com (sorry, U.S customers only), for those that don't want to miss out when the first batch is shipped on the 15th of November. Amazon Android App Store's DRM: Too Draconian? Are Publishers Abandoning Apple For Google Android?